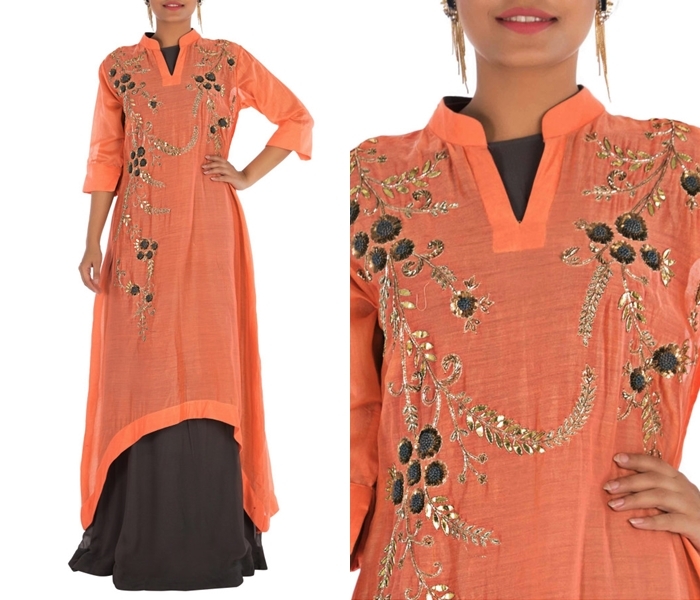 Say goodbye to your old deep and broader necklines on Kurtis! For your kind information, this is time for fine full neck kurtis. Don’t believe us? Take a good on all the leading celebs and your favorite fashion icon’s latest outfits; you will see what we are trying to say. Yes, it is official that this season is more about wearing full neck kurtis aka high neck kurtis along with more sophisticated silhouettes. Time to ditch the boring sleek kurti style, and opt for fancy hem lines and cuts along with high neck designs to nail this kurti trend. 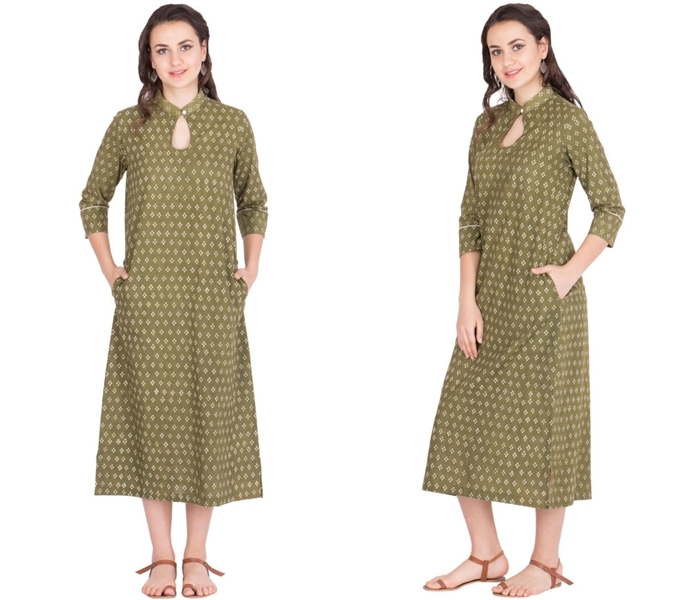 Imagine wearing this stylish high neck kurtis with sleek bun, and tote or sling bag to tow you. Needless to say it aloud, you will be the showstopper for sure. 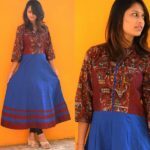 The term full neck is too broad to explain this kurti neck style. If you care to go in detail, you will see there are plenty of options underneath it, and you will be surprised that all have tendency to up your style factor a lot. 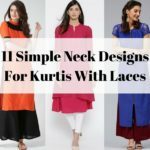 Let’s see the various full neck designs to try with kurti. Round neck is not new. However, it is time to let the neckline as close to your neck, so it gets a full neck look. Wear this neckline with flared kurti bottoms to see how structured your look can get. Wear a messy bun and opt for long delicate chain around the neck to elevate this kurti style further. This neck can be worn by anyone irrespective of their bust size. Closed high neck is another design that’s making waves in the fashion radar now. Plain kurtis with an embellished closed neck line calls for an elegant ethnic outfit. 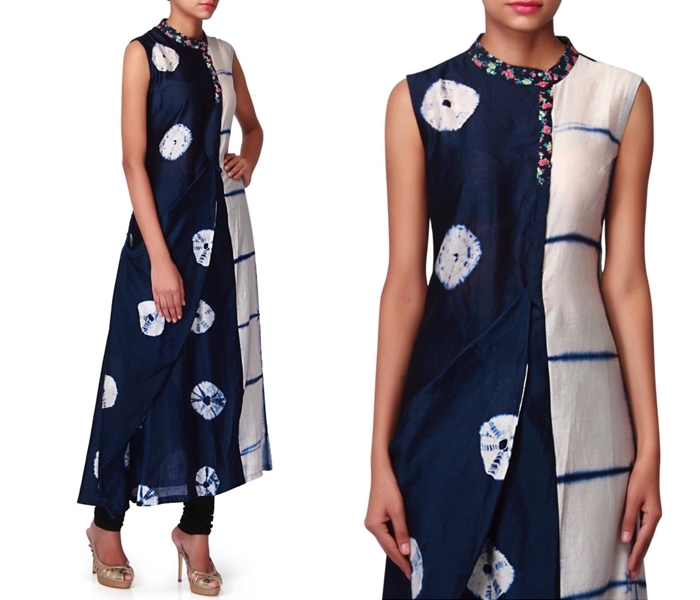 Instead of zari or other loud adornments, you can even opt for printed collar necks to make your kurti style notable. Wear this with slim leggings and pumps to finish off the style. As the name implies, this neck line goes well with shirt style kurtha and kurti. 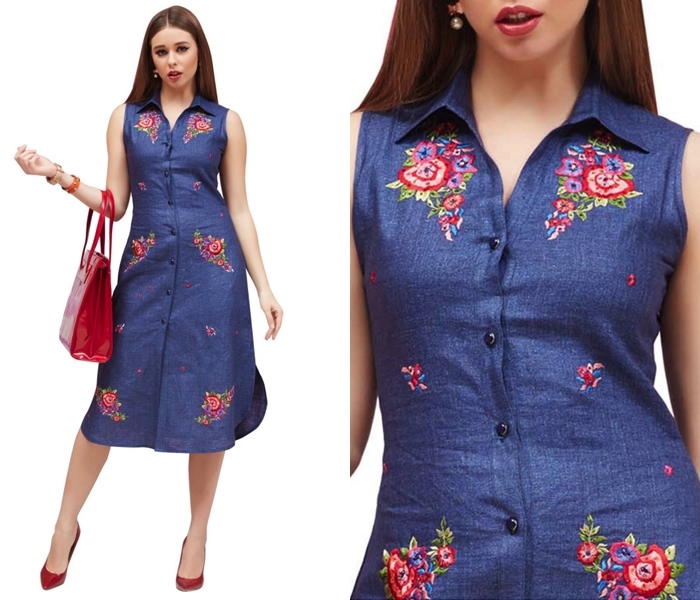 This is another kurti style which makes a great option for daily wear. It’s a blessing for college teens and office goers owing to the simplicity and chic silhouette it brings to the light. Wear this style with leggings or broad palazzo pants and finish with a platform heels to nail this look. If your kurti has layered hem, then having a layered high neck line will be a complimentary one to try. Make a peek-a-boo with your layered neck line and have lots of embellishment around the neck to keep the attention there. 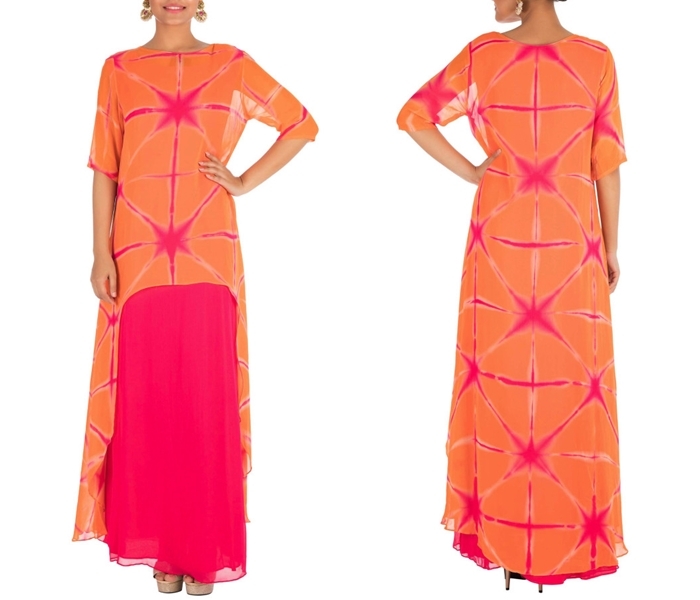 Try a long or three fourth sleeves with this kurti style to look super chic on it. As the name suggest, if the neck line implies a boat shaped structure, then it is called as boat neck kurtis. The neckline usually tags very closer to your actual neck. This neck style is a super hit this season. Not just your kurtis, your saree blouse and lehenga blouse can also be worn with this neckline to look stylish. 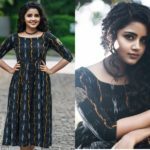 V necks are another well tried and tested out neck model in kurtis. However, it is time to shorten the length that spans across the neck and collar bones. This will yield a more fine neck design that will look extraordinary on your high-low kurtis. 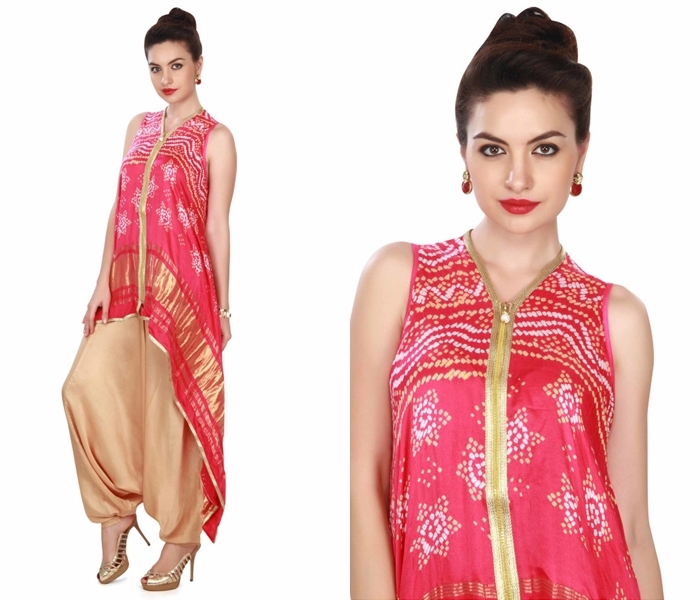 Pair this style with dhoti or patiyala pants for an impeccable style. Thanks to leading designers, we no more rely just on cuts to get attractive neck lines. Mix of different fabrics and patterns around the neck are used to create interesting illusioned necklines. One such voguish model is asymmetric high neck design. Get this asymmetric work extended up to hem line and you will get a nice designer kurti look here. 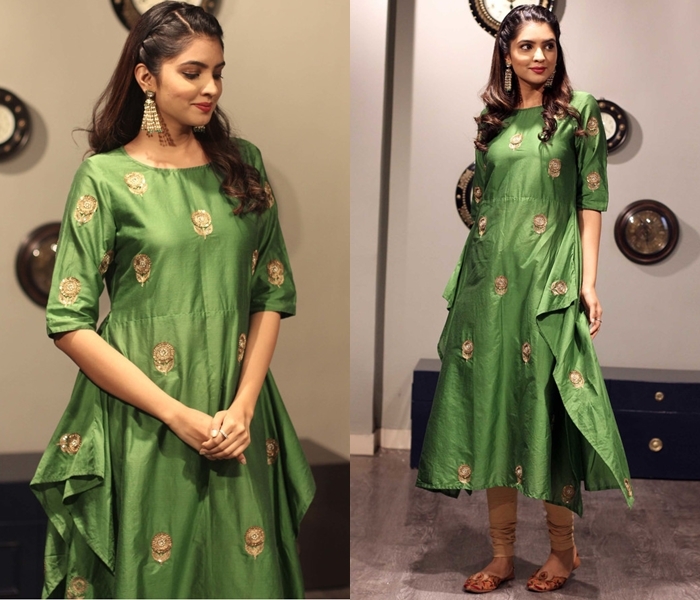 Sometimes high necks can be too blunt to try on certain plain kurtis. It is quite understandable. Because this kurti style is going to cover up your entire neckline and so you can’t even wear your favorite necklace as you wish to be. However, if wearing a close neckline pose a problem to you, then having a key hole with chic cuts in the front will help you fill the void and resolve the problem. You may still not wear your best necklace, but in that place you will have a incredible neckline to do the talking. Just like V neckline, U neck line is another popular neck design with Kurtis. As you have guessed it right, you need to shorten the neckline length here. Bold and broader necks are taking exit now and in the place you need to have a close one like the below. Another form of extension you can try on high neck, next to key-hole neck design is a super fine thread tie-up. Go for contrasting colors for the thread to make the work more visible on your kurti and create the needed impact. 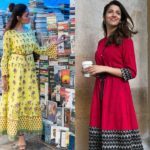 These are some full neck kurti designs that you can try this season. Of course mere neck design is not going to get you in the inspiring mode. We know you need real women to understand the style these neck designs can bring on to your kurtis. 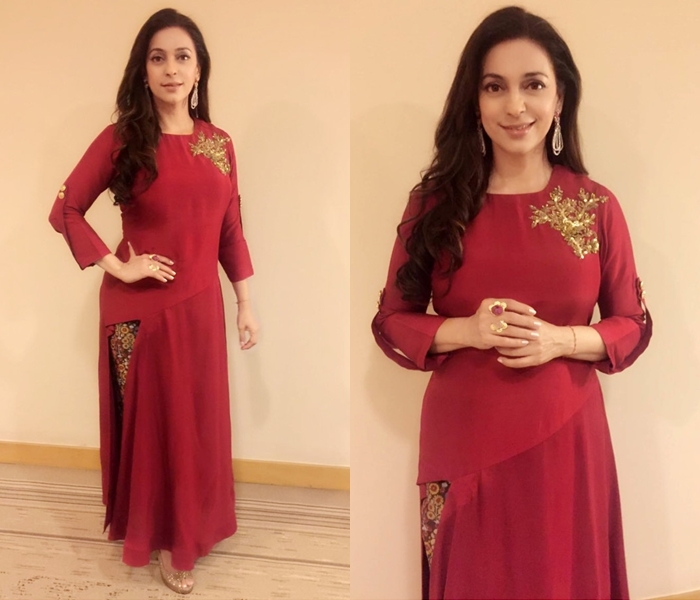 Now time to see your favorite celebs styling these kurtis with their own fashion spin. Believe us after you see these A-listed fashion icons flaunting these beauties; you will forever fell for this neck pattern. Here is Kajal Agarwal looking regal in her high neck kurti aided by fine small pleats. A huge statement earring is all she needed to make this style work for her. Kriti Sonan took up this neck style on a floor length anarkali and made eyes glued to her during her upcoming movie promotion. Sleek middle parted hairstyle and bold ear stud helped the actress refine this style further. 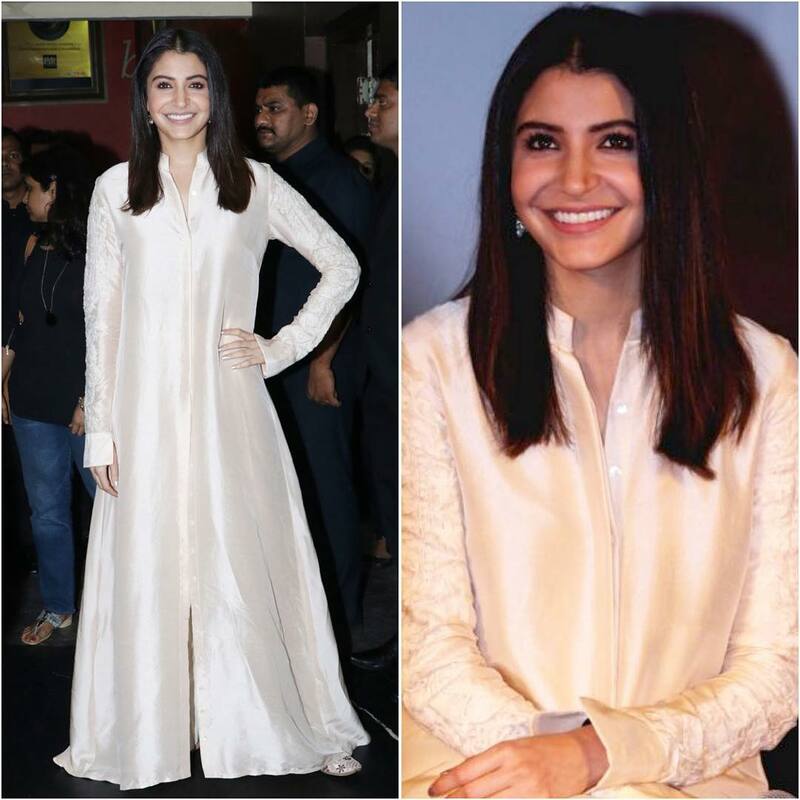 It was layered close neck kurti for Anushka Sharma and she paired this with a skirt. Sleek cloth buttons are used on the neck line for an interesting effect, and it did work wonders on the actress overall all style. 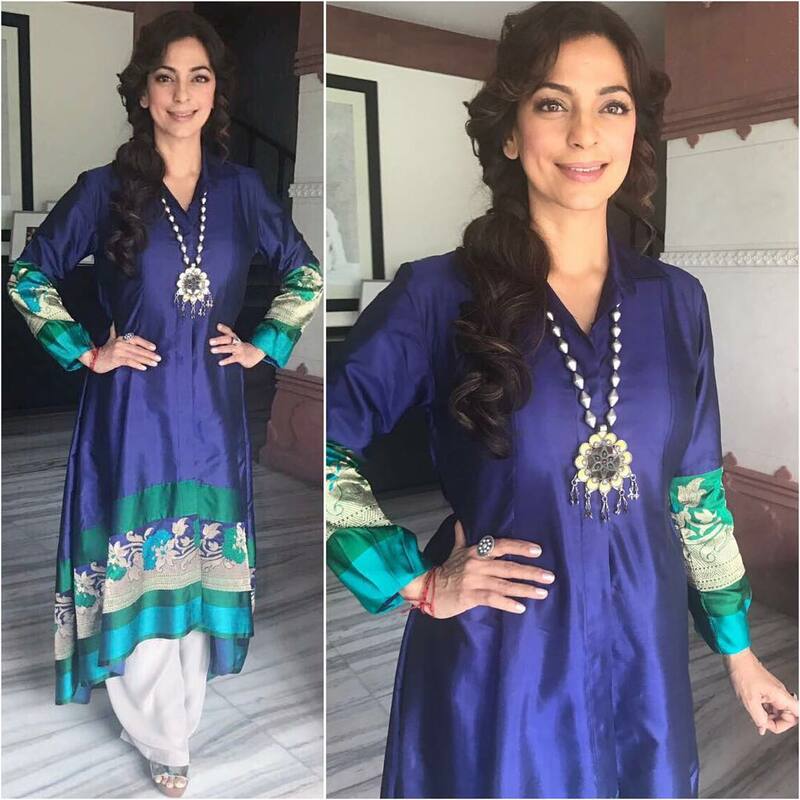 Juhi Chawla went for a shirt sytle kurti and a long antique neck piece to nail this neck trend. She opted for a dhoti bottoms to balance out the relaxed fit in the look. This is Anushka Sharma again wearing the classy shirt sytle kurti with leggings this time. This manish malhotra number had a fine collar neck which the actress made to work on her favour with a sleek hairstyle. Here below is Kajol wearing a high neck salwar with just about a pair of bold chandbalis to ground the look. For Rakul Preet, it is just a round high neck tops and pair of silver jhumkas to win this trend. She opted for a high pony that complimented her neck line flawlessly. 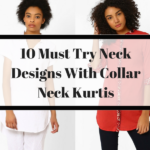 Now that you have got all the real inspiration to try this trend, time to choose the full neck style that aligns with your personal taste and wear it without fail on your next kurti day. And don’t forget to tell your favorite neck design among the list by dropping your comments below. 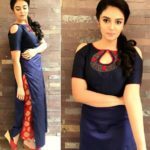 Previous articleSometimes Your Silk Saree Needs Just a Simple Blouse – Here is Why! Next article14 Antique Jhumka Designs You Will Wear For Years!